We know that the Cylons are considered 'machines'. But why do the characters continue to refer to them as 'machines' even when we know they're organic? Unless of course, that the humans consider anything fully organic as 'machines' as they are completely different to what they themselves are. We know the Cylons are fully organic. Heck, we know their Raider spaceships are as well, we've seen inside them. But we've never seen the insides of a human. For a show that is happy to show lots of blood and shooting, we've only ever seen humans with flesh wounds. No bones, no organs, nothing. How do we know what characters call a 'heart' is really a heart, not some sort of mechanical pump. How do we know what they call blood isn't just fuel. Words are just words. It is possible that the 'humans' simply have some sort of fleshy covering with red fluid in their veins. There are many occasions in the show where characters see things they shouldn't, or share hallucinations, most obviously when several human characters find themselves in a shared vision of Earth at the end of season 1. How could this happen if they were human? Machines have network capacity in their minds. This would also explain Baltar's constant visions of Number Six. He doesn't have a Cylon chip in his head, but his mind is one big chip. If the Cylons were simply human clones, then creating a Cylon/Human hybrid would be simple and hardly a massive project. If the said baby was a true cyborg however, that would be a far bigger deal. Admiral Adama is fixated with finding rare metals to 'ensure the fleet's survival'. Could this be to construct more 'humans'? 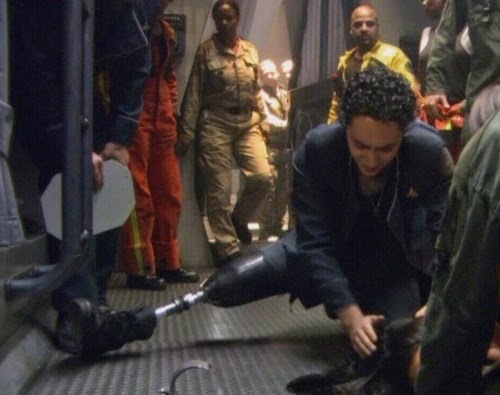 The character Felix Gaeta is shot in the leg in season 4. The medics operate on him, stripping away the fleshy covering. Next time we see him, it is possible to see his exposed robotic bone if you look carefully. At the start of season 3, Lee Adama is grotesquely overweight. In the space of half an episode though, he has removed all this weight and regained his previous god-like physique. The idea that he could quickly lose this weight is ridiculous; more likely is that this was simply an 'upgrade' to his body that he uninstalled. Most damningly of all, Admiral Adama enjoys eating walnuts. How does he eat them? By breaking the shells in his fist. This is given special focus in season 2. Crushing a walnut even in a nutcracker is astonishingly hard. Research tells us that it takes a force of 3-500 Newtons to be able to crack the shell, and yet Adama can do it casually in his fist. This indicates enormous mechanical pressure that his (mechanical) hand can exert. The fact that so many human characters treat the equally organic Cylons with such hatred and distrust and conviction that they are 'machines' speaks to the idea that there is something more fundamentally different. To a machine, something organic would be terrifying and 'other'. We assume that the humans are human as we bring with us our own preconceptions. But Battlestar Galactica is a show about shattering these preconceptions.